We left Holland and drove towards home in the rain, past Arnhem, Eindhoven, Antwerp, Gent, Ostende, arriving at Calais mid afternoon. 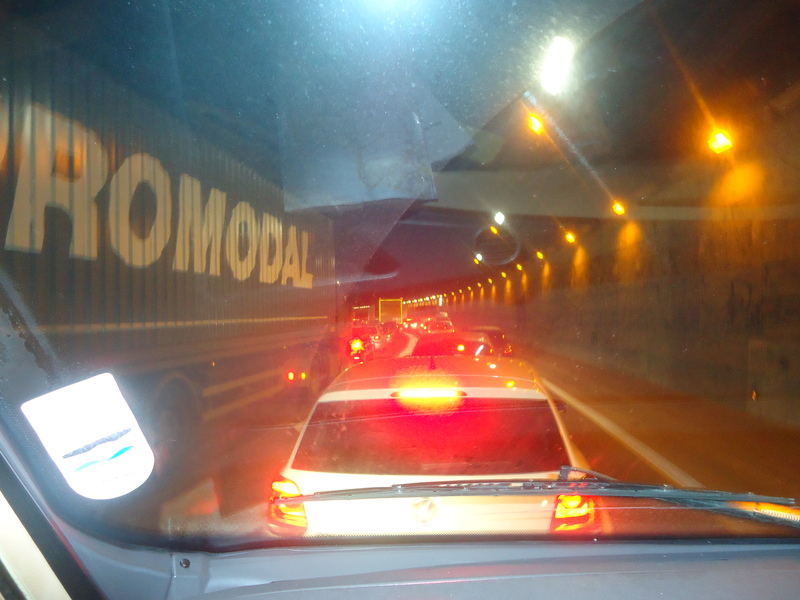 That morning, online, we had booked Eurotunnel for our return journey the following day. We were offered a choice of crossings at different prices depending on how popular each service was. They usually run three services an hour, we chose a €120 slot for 2 pm the following day. We have found in the past that, if you happened to arrive a little earlier than your check in time, as you go through the barrier at the entrance, the check in computer offers you earlier times of travel if they have capacity. If they are fully booked they put you in a holding section until it is your time to travel – with shopping opportunity. They always strike us as such an efficient company. We parked up at Cité Europe, a huge retail outlet at Coquelles, one exit away from Eurotunnel. The site had a dedicated car park for camper vans although, according to our motorhome guide books, this was not considered safe to stay overnight; consensus was that it was perfectly secure, being adjacent to the main police station and close to a huge retail facility. We parked up and wandered about the shops before having a meal in one of the many restaurants. It was a bit like eating at Heathrow or Gatwick airports, each restaurant had a theme but you felt all the catering was done by one supplier. We had a Chinese meal, two courses with wine €58, it was very good. The shops and restaurants all closed by 10 pm, by which time we had settled down for the night. Our car park was now deserted but for three camper vans all parked fairly close together, looking strange in the eerie yellow light of the car park. We could hear sounds of drunken shouting in the distance, the wind was blowing a gale but we felt pretty secure in our brightly lit haven, probably watched by security cameras. All was quiet and our blackout blinds meant the inside of the camper was pitch dark. Just after midnight we heard the sound of a vehicle pulling up close to us and we heard car doors banging. I peeped out wondering whether it was anyone wanting to harm us but it was just another camper van stopping for the night. Soon all was quiet again. Any sign of trouble the man of the house would have been sent out to restore order – in his underpants armed with a wooden policeman’s truncheon ready to defend his trembling wife! Blog ends – Do I hear a sigh of relief from Kate’s work colleagues! The following day we had a long day’s drive to get us within striking distance of Peter Bouwens at Transport Techniek Ulft BV, Holland. The weather was fine, sunny and cold; we tackled Paris during the morning rush hour and TomTom didn’t let us down. Within an hour we were clear of the city and heading toward Lille, then on to Brussels and Eindhoven. We had breakfast in France, lunch in Belgium an evening snack in Holland. 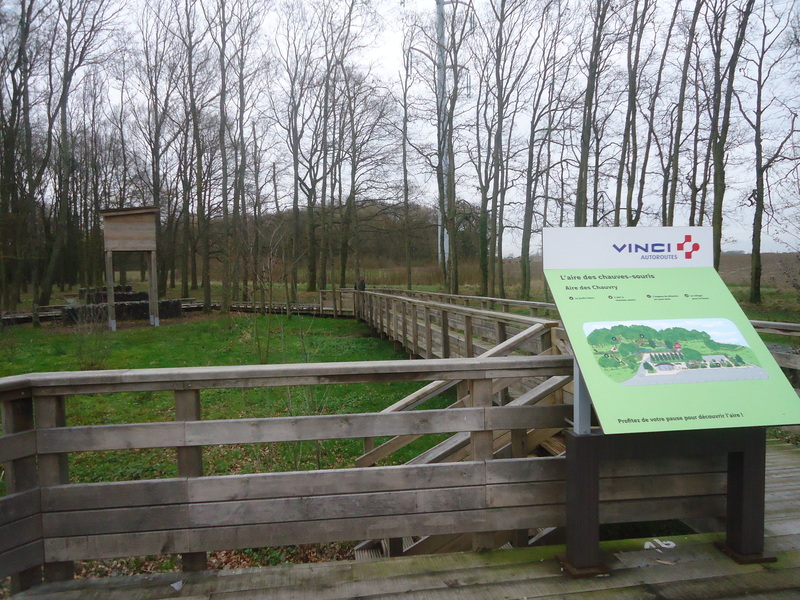 Our campsite was in Beek, very close to the German border and, in order to get to the site, we had to leave Holland, enter Germany, turn right and drive down the road and re-enter Holland. Fortunately we no longer had passport control and Customs to deal with. It was getting dark when we arrived, a staff member showed us an area of grass where we could park, we drove onto the grass and promptly got stuck in the mud. 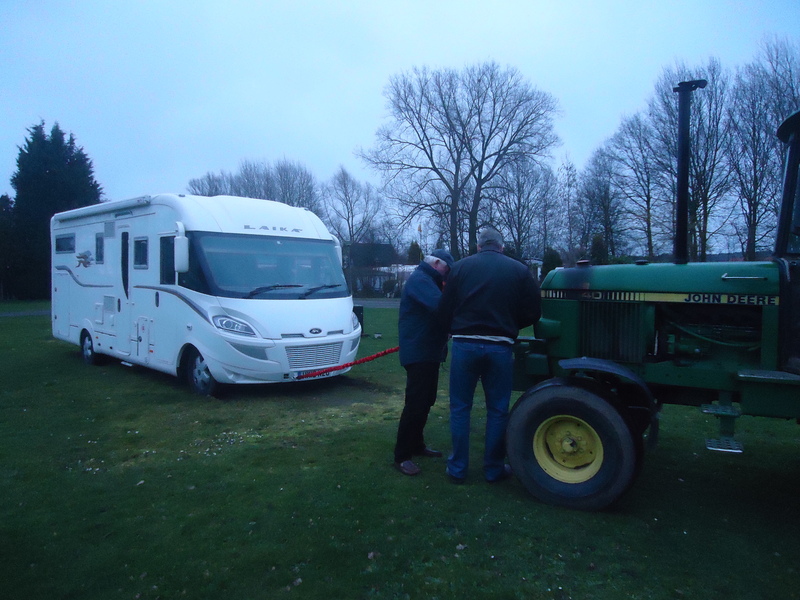 Eventually help arrived with the Dutch equivalent of Frank Brown who towed us out with his tractor. We felt such fools! 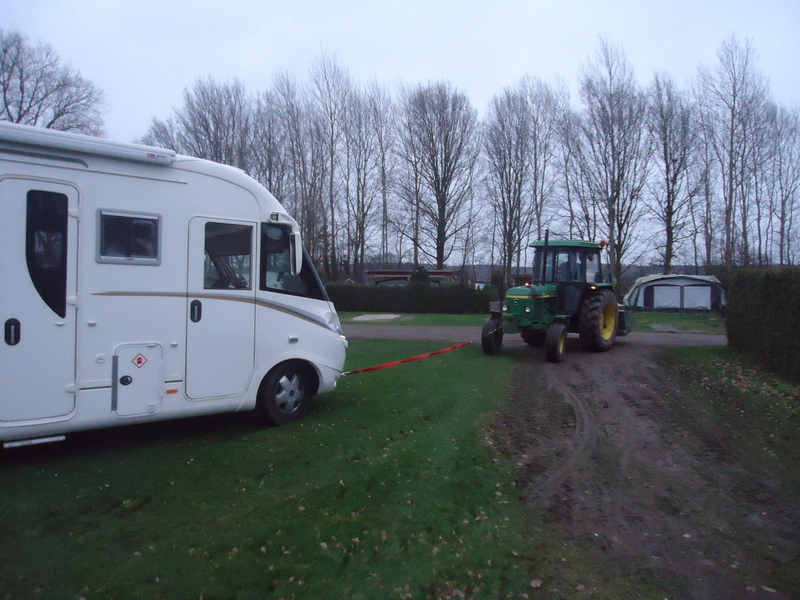 Next morning we dropped the camper van off at Peter Bouwens and he kindly lent us a car. We drove into the nearby town of Doetinchem where we had a coffee and a walk around before stopping at our favourite restaurant for some lunch. We collected the camper after lunch and returned to our Beek campsite that afternoon. 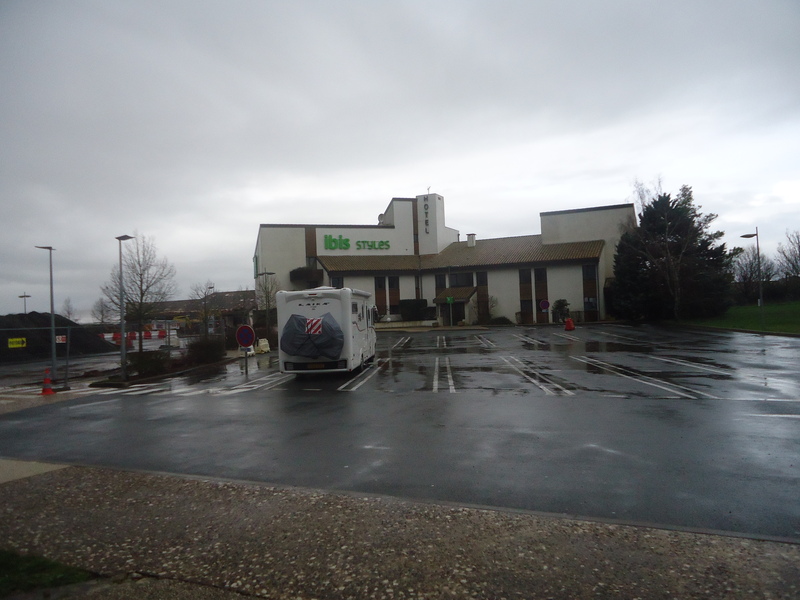 We spent the night in the car park outside the Ibis hotel. 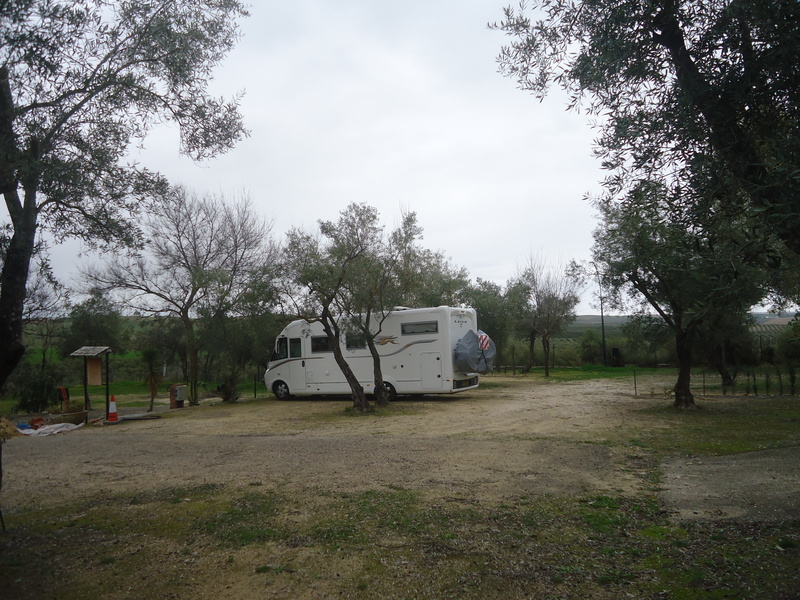 It was hardly “wild” camping but we had no electric hook up so were relying solely on battery power and we occasionally had to run the engine to top up the domestic battery – probably because we were watching TV all evening. Charles had advised us to avoid Paris but at that time of year there was a dearth of open camp sites and the only one we could find on our route was at Champigny-sur-Marne on the east side of Paris, so we decided to risk the peripherique. 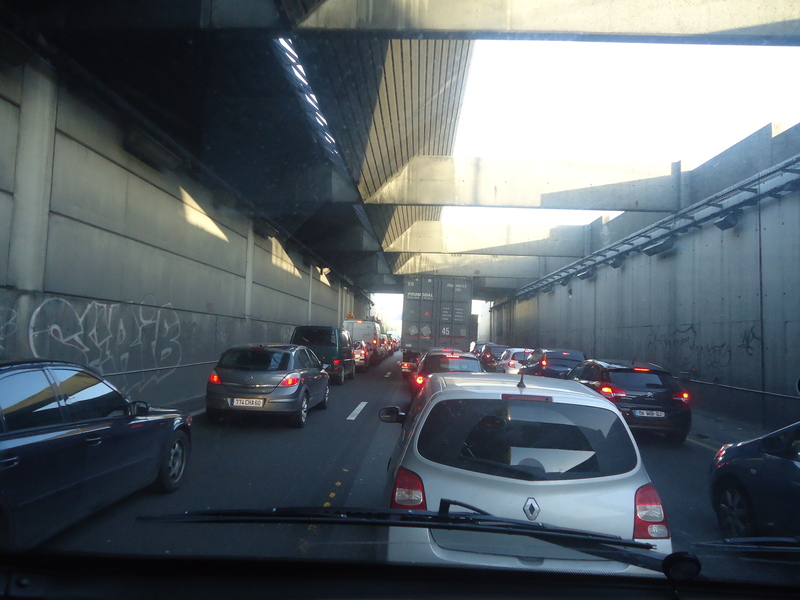 The last time we tried crossing Paris in the camper we ended up heading at speed towards an underpass with a height restriction that was too low for our van. Tony saved the day at the last moment by taking an emergency slip road. The next hour or so was spent trying to find our way back to our route – tempers got a little frayed; we were fervently hoping that this time we wouldn’t repeat the “Lost in Paris” experience. Not good for marital harmony. We stopped at an aire for a cuppa and leg stretch, it was a pretty little place with a circular boardwalk amongst the trees. Unfortunately the place was marred by litter louts, there was orange peel scattered just where we parked and the French family parked next door were relieving themselves in the road in spite of their being a perfectly useable toilet block on the site. Madam merely crouched down behind her car door and did her business in full view of Tony who was walking around the boardwalk behind her. Unfortunately, there is no photograph of the act as the writer was too shocked to pick up the camera but all that she could see was the two feet poking out from under the door with a foot in each corner and a gush of pee in between – she can’t have been wearing knickers. The couple then got back into the car, leaving two puddles of pee in the road. As they drove away they chucked a load of sweetie papers out of the car. 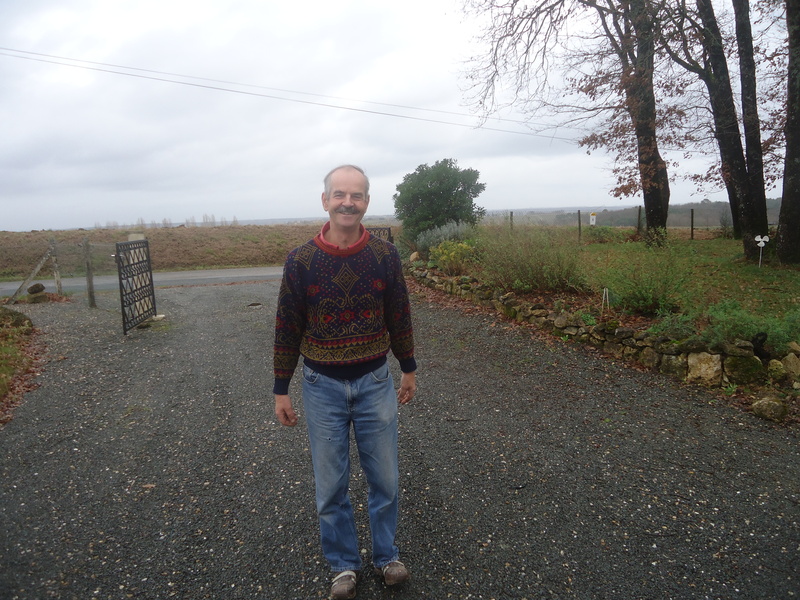 By the time we approached Paris the rain had stopped and we had hazy sunshine and dry roads. Tony told me to look left for a fine view of the Eiffel Tower; but I could see more than one tower, I could see a whole row of them and they had wires connecting them, they were huge electricity pylons! Tomtom did us proud and safely navigated us through the city traffic ensuring we were in the correct lane at the appropriate time. We hit Paris at twenty five to, drove anticlockwise for and half an hour, emerging at quarter past. The camp site didn’t look its best in the milky winter sunshine but it was fine for one night. Disneyland Paris was 35 minutes away by public transport. Were we tempted to visit? No! The air suspension in the camper was not working properly due to an air leak. We had the system fitted in the UK and, not long after, the front components failed. The UK were unable to get replacement parts before we were due to leave on our next trip so we drove the van to the manufacturer in Holland and they were able to fit the new components. A year on and the same thing had happened again so we were heading north to Holland to get the manufacturer to sort it out. On our journey northward we happened to pass Chez Lamb. 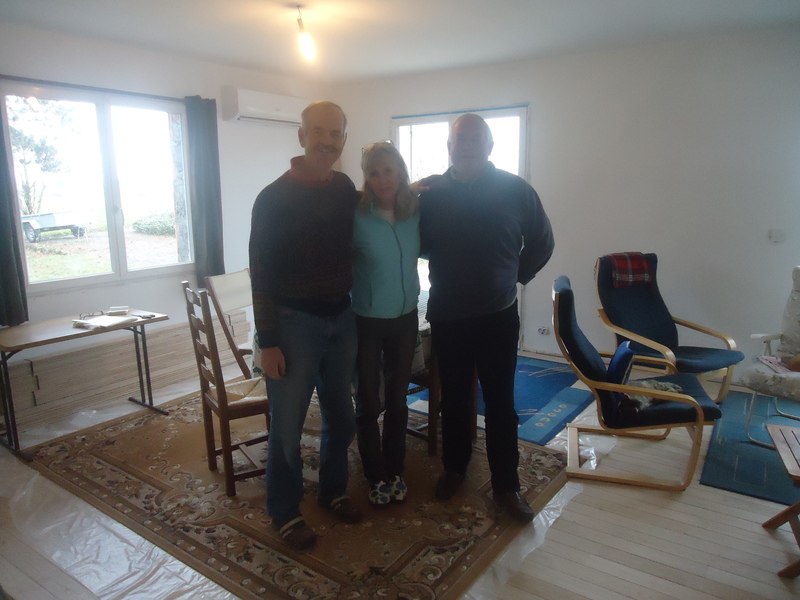 We had called in on Caroline and Charles on our way south; they were renovating the house they had recently purchased and we were interested to see the progress made in the three weeks since we last visited. The kitchen was being refurbished and on our previous visit they had no cooker but Caro still managed to produced a delicious meal. By our second visit there was a brand new cooker installed and we were able to sample her home made cake and biscuits. Charles was in the process of laying a wooden floor in the living area but, in spite of all the upheaval, we had a lovely evening together but being very careful not to spill anything on the brand new, untreated wooden floor where one drop of red wine would have stained the pristine surface permanently. 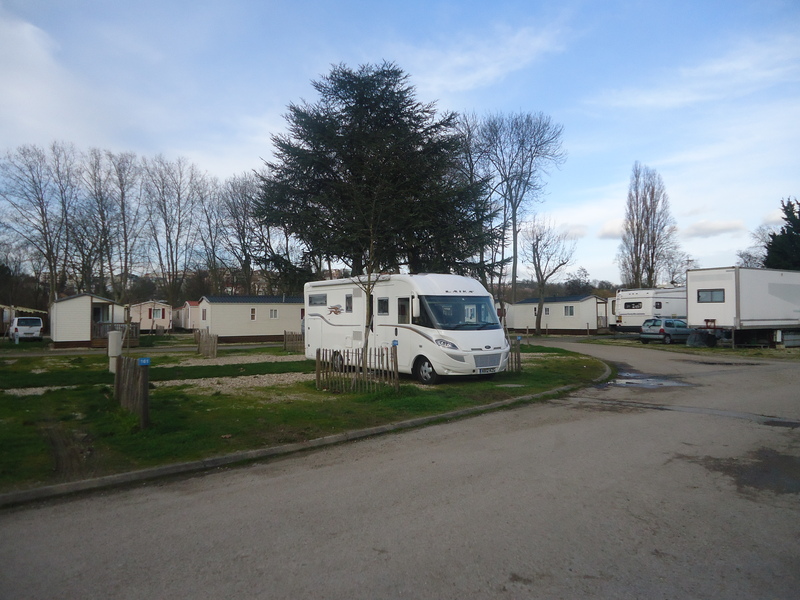 After coffee the following morning, following route advice from Charles who regularly drives to the UK, we left Marmande and headed towards Bordeaux then Sainte, Niort and Poitiers. It had been raining heavily the previous night and we were expecting the weather to clear so we would get in a good drive on the quieter Sunday roads when no commercial vehicles are allowed to travel. The sun did come out occasionally but most of the journey was in pouring rain. By 3pm we had had enough and decided to stop at an aire on the motorway. 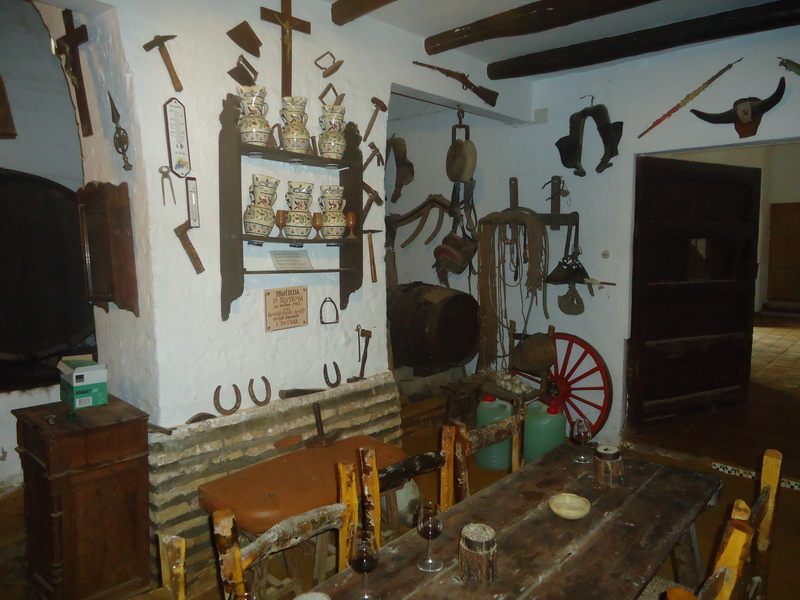 We had the most expensive meal ever, steak, salad and chips, dessert coffee and wine, €80. This was in an Ibis Hotel restaurant on the motorway. We felt we had been robbed. One of us is happy watching the rugby on TV! 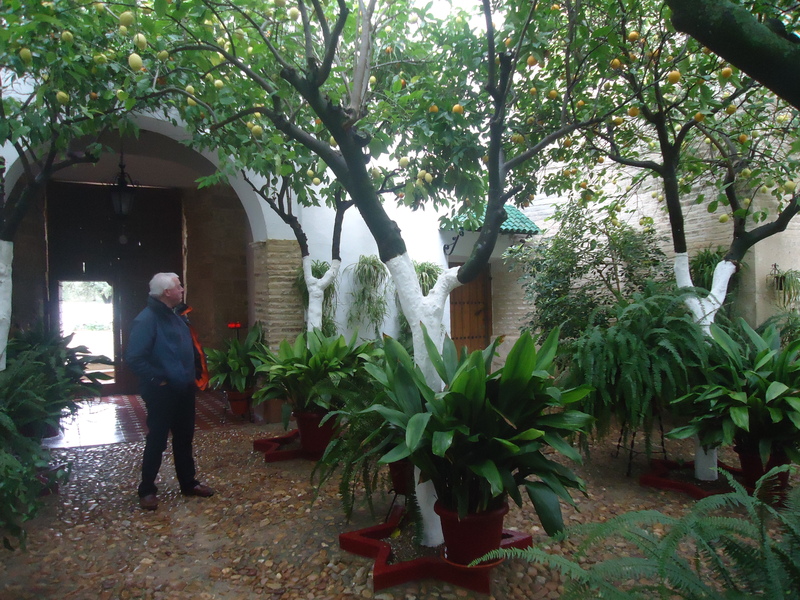 We drove north, past Cordoba and Toledo towards Madrid, stopping at Aranjuez for the night. We had lunch en route, €10 for a delicious freshly cooked meal. 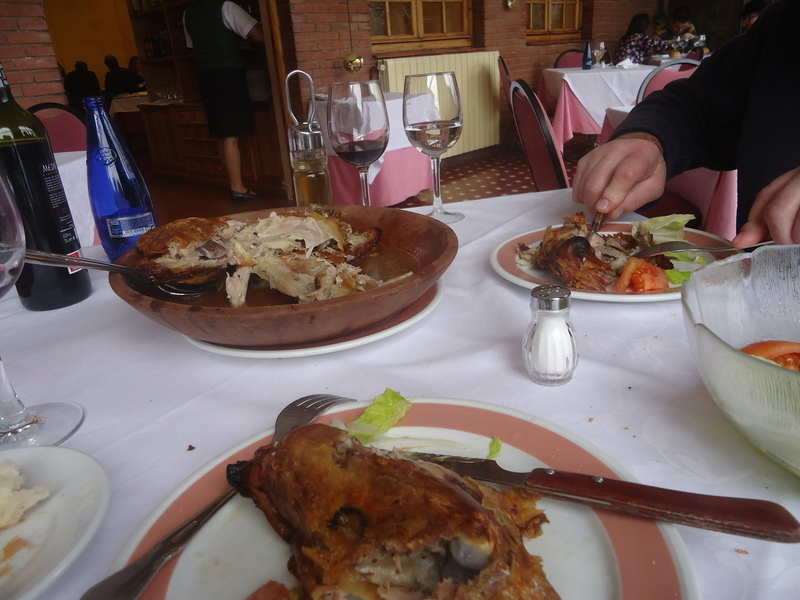 Tony had Mortilla De Burgos, a local delicacy, a sausage type thing that was sliced and fried. It was very tasty. Aranjuez was a beautiful town 40k south of Madrid and would be an ideal base for visiting the capital. There was a direct train line, called the Strawberry Line, that ran right into the centre of Madrid and in the summer they run a special steam train into the city. The following morning we set off for Haro, revisiting an area we had last seen in the spring on our way to Portugal. 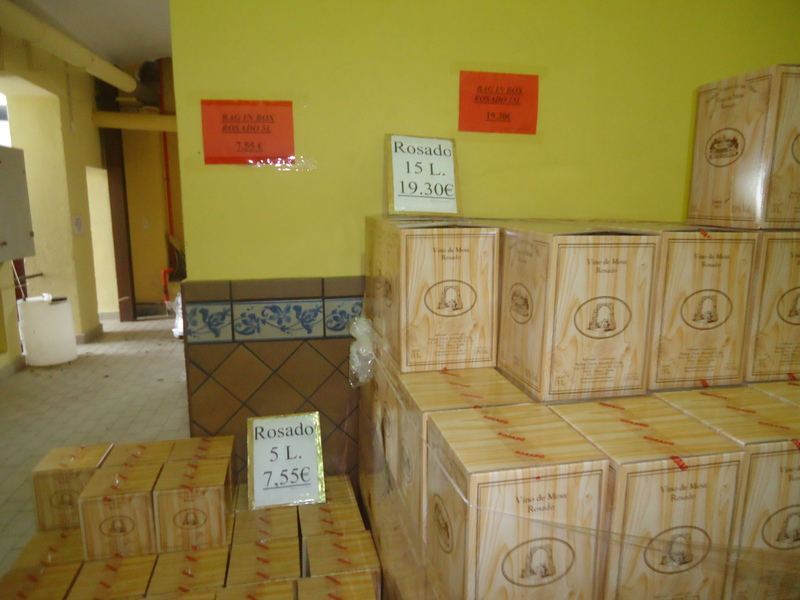 We stopped at a bodega in Aranda de Duero that specialises in the local wine, Rioja. We enjoyed a wonderful lunch which consisted mainly of a quarter of a lamb, served with salad. 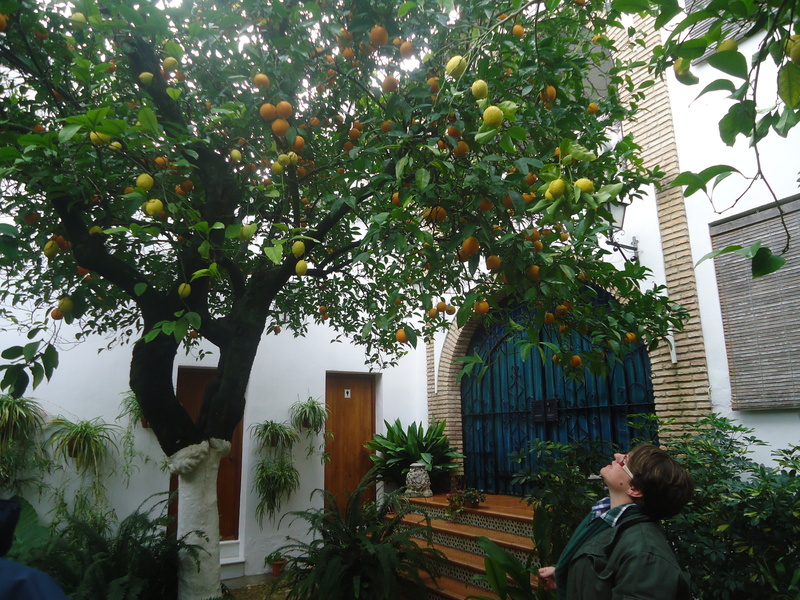 We originally met Matilde and Rik in Morocco. 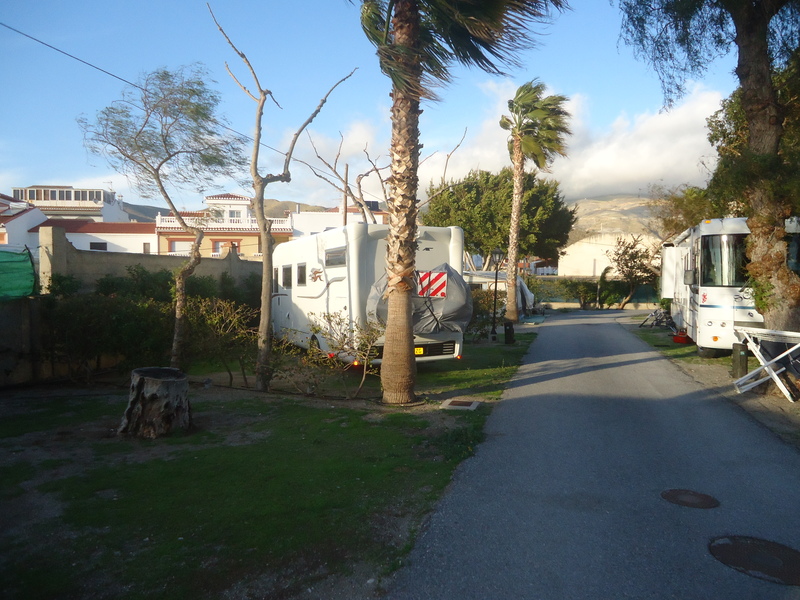 They told us they ran a small, independent camp site, La Campina, at Santaella, south west of Cordoba. We decided to pay them a surprise visit and, as luck would have it, we arrived on the dot of beer o’clock. 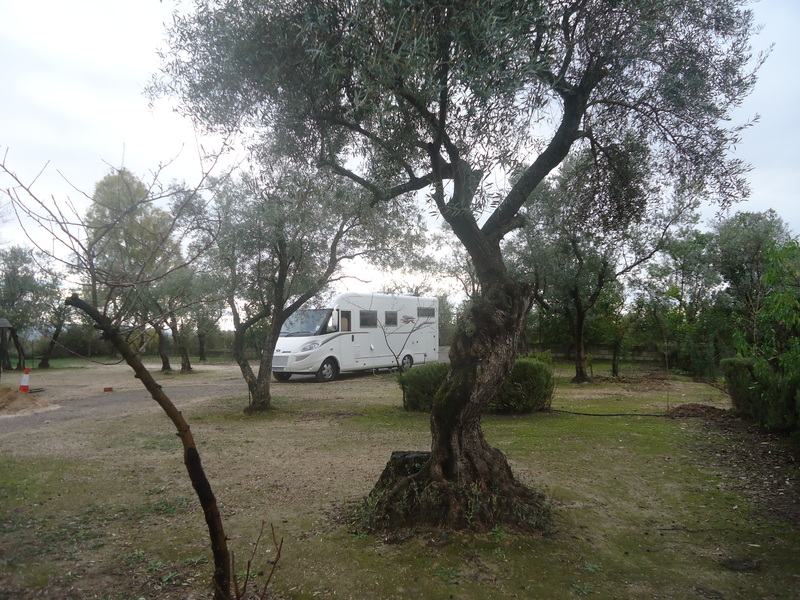 After a few drinks, accompanied by Matilde’s home made olives, they showed us to our pitch amongst the ancient olive trees. 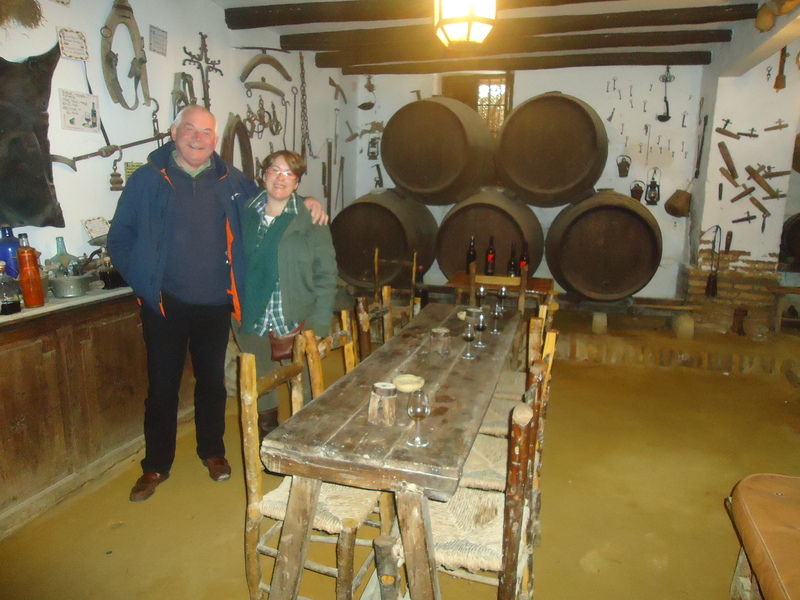 That evening Rik lit the log burner and Matilde produced an impromptu supper of soup followed by chorizo, tortilla, chicken wings and salad with fresh pineapple and cream for desert and plenty of their lovely local wine. The following day Matilde gave us a tour of the local area followed by tapas in a local restaurant with Rik and her mother and father. 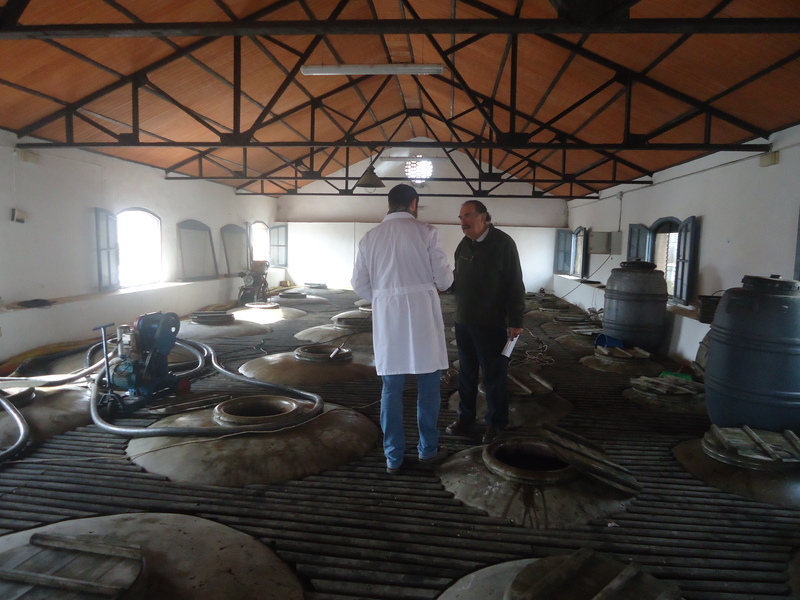 The main crop in the area was olives – to produce olive oil but some olives were processed to be eaten whole. The area was famous for its dulce de membrillo, a type of quince paste. They also grew wheat, garlic, vegetables, grape vines and, surprisingly, cotton. We visited Laguna de Tiscar, a secluded lake along a long dirt track where we watched a flock of about seventy beautiful pink flamingos feeding in the shallows of the lake. We stopped at a local bodega and tasted a special local wine, made from grapes that had been left in the sun to dry, like raisins, before being made into wine. The result was sweet and delicious, wonderful as a digestif after a meal. We bought a couple of bottles, as well the local olive oil and some black garlic which, we were told, was a great delicacy, created by heating the garlic in a humid oven. We learnt how to tell the difference between sweet and bitter oranges. Matilde said that the fruit on the orange trees lining the streets were mainly bitter oranges and the council came and picked the oranges and threw them away before they had a chance to fall on the ground and make a squashy mess. I had just missed the Seville orange season in the UK so decided to pick some of their bitter oranges to take home to make marmalade. Not sure whether they are quite the same thing, but worth a try. We finally managed to wrench ourselves away from the luxury of La Marina and our first stop was at the local garage to fill up with LPG (liquid petroleum gas). Our heating system runs on gas, and we also use gas for heating water and for cooking, including the barbecue. We had been away almost three weeks and one of our two LPG bottles was showing empty. 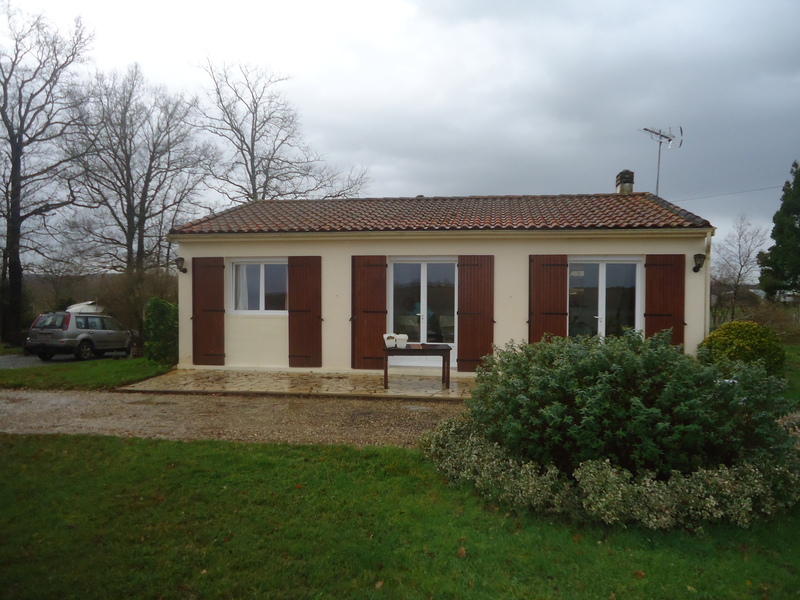 We hadn’t used the heating a great deal but when the outside temperature could be as little as two degrees – a bit of heating encouraged us out of bed in the morning. We did not want to run out of gas. 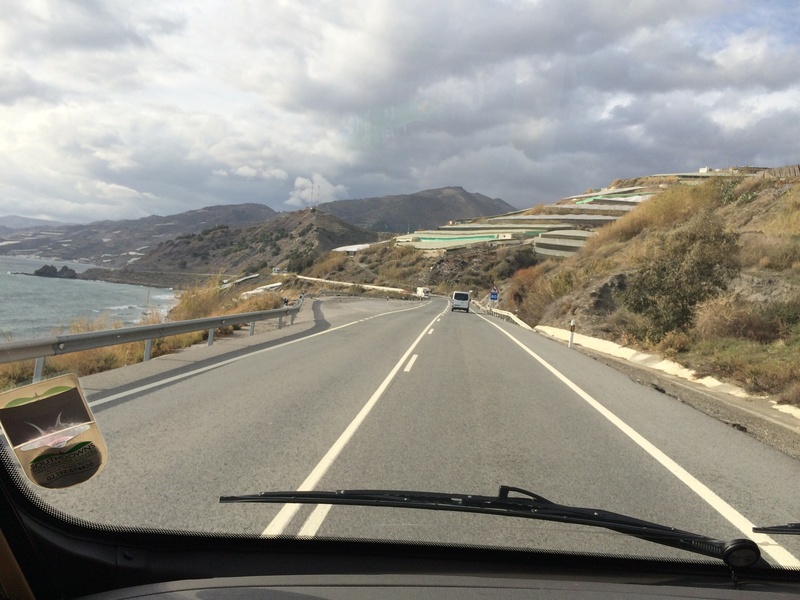 We continued driving south following the coast, leaving the Costa Blanca and heading for the Costa Del Sol. 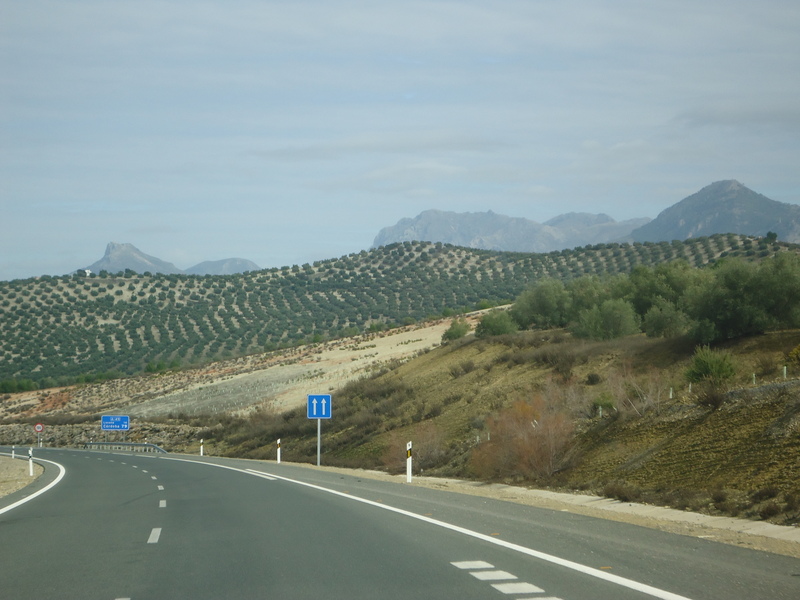 We travelled past Cartagena and Almeria, arriving later in the day near the town of Motril in Granada. The whole area is sandwiched between the Sierra Nevada and the coast and was sheltered from the cold north winds by the mountains and warmed by the Mediterranean sea, giving the area a climate of warm summers and mild winters. The drive along the coast with the mountains to the north and the rocky coast to the south would have been spectacular had it not been for acres and acres of horticultural polytunnels. We drove past hundreds and hundreds of miles of polythene, huge plastic tents stretching away as far as the eye could see. Where the ground was steeper, the plastic was arranged in terraces on the hillside. Until 2006 sugar cane had been the principle crop of the area but today they grow avocados, tomatoes, guava, mango, banana and all kinds of exotic fruit to be shipped out in huge lorries to Northern Europe and beyond. Later that afternoon we arrived at Camping Don Cactus in Carchuna, a campsite alongside the beach, surrounded by more polytunnels. Unfortunately, the weather was cloudy and windy, the pitches on the site were tiny and they were refurbishing the toilet block. 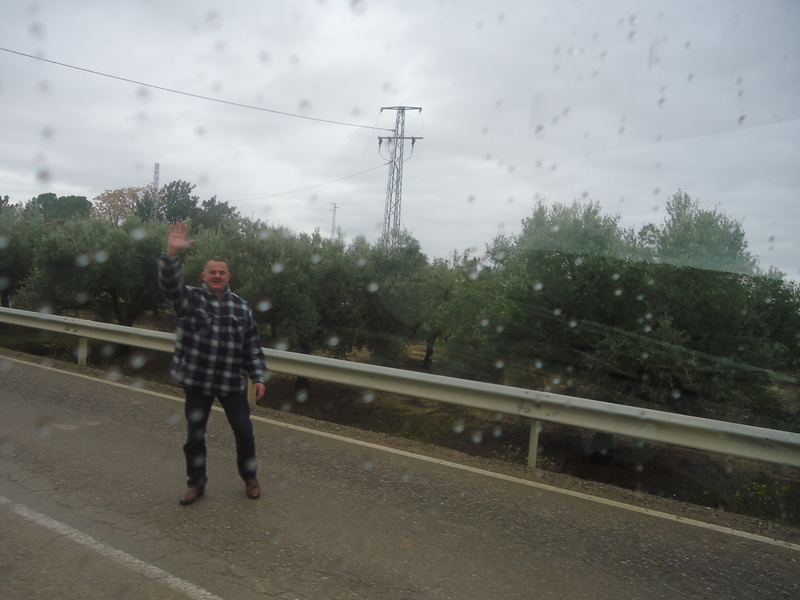 We decided to stay only one night before moving on, heading north towards Cordoba. The drive was much prettier once the polytunnels finally gave way to olive trees punctuated with a few vines.